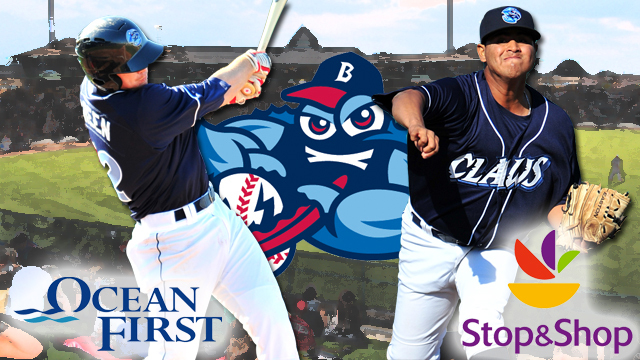 LAKEWOOD, NJ - The BlueClaws have partnered with OceanFirst Foundation and Stop & Shop to raise money for local organizations when a BlueClaws batter hits a home run or when a BlueClaws pitcher strikes out an opposing hitter at FirstEnergy Park this summer. The BlueClaws and OceanFirst Foundation have again partnered on Home Runs for Heroes, a program that raises money for local military-based non-profit organizations. Each inning of the game is tied in with a local military-based organization. Each time the BlueClaws hit a home run in Lakewood, OceanFirst Foundation makes a donation of $1,000 to that organization. For a rundown of charities, please click here. The program is now in its sixth season and has raised over $120,000 so far. For more on OceanFirst Foundation, click here. The BlueClaws and Stop & Shop have again partnered on the Strike Out Hunger campaign, through which Stop & Shop makes a donation to the Food Bank of Monmouth and Ocean Counties for every BlueClaws strikeout by a pitcher in Lakewood this year. Last year, the program raised over $10,000 for the Food Bank, which supports over 260 pantries and soup kitchens at the Jersey Shore. Further, this year, as part of their 100th anniversary celebration, Stop & Shop will give out a $100 gift card to one lucky fan each time the BlueClaws reach a 100-strikeout milestone this year (100th, 200th, etc strikeout of the year). For a program rundown, click here. The BlueClaws are the Jersey Shore's top stop for affordable, family entertainment. They have led the South Atlantic League and New Jersey in attendance in all 13 years of existence. For tickets to any BlueClaws home game, call 732-901-7000 option 2 or click here.